Cut each pear lengthwise into 8 slices. Unroll both cans of dough on work surface; separate into triangles. 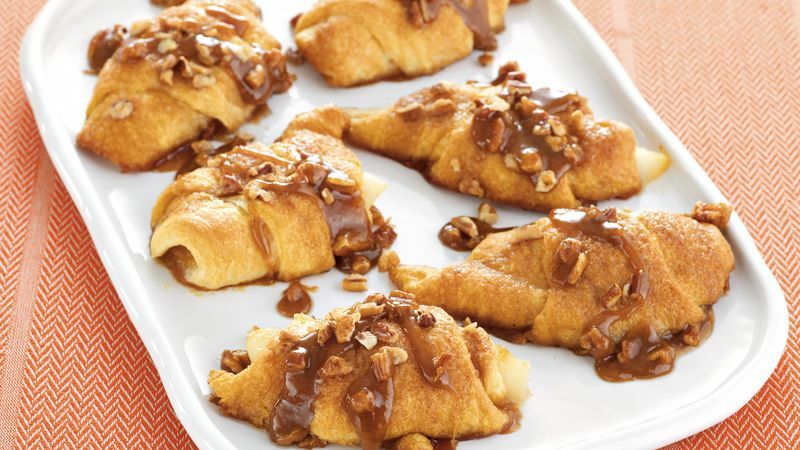 Spread about 1 teaspoon caramel topping on each triangle to within 1/4 inch of bottom edge. Place 1 pear slice across wide end of each dough triangle to within 1/4 inch of edge. Roll up, starting with wide end. Place point side down in baking dish. In 1-quart saucepan, melt butter over medium-high heat; stir in brown sugar and cinnamon. Cook, stirring occasionally, until brown sugar is dissolved. Pour over pears. Sprinkle with pecans. Bake 30 to 35 minutes or until golden brown. Serve warm. A scoop of vanilla or butter pecan ice cream puts this treat over the top.